It’s Not Just a Body! It’s a Promise! My thoughts somehow still return to mummy or the embalmed body or the great Ramses I which, after being looted from his tomb in the 1800s, was discovered here in North America and then finally returned to Egypt just a few short years ago. Excerpted from our previous study: Shepherding in Goshen…Gen. 47:1ff: “Many scholars date Ramses I to the 1290s BC, which is about a century and half later than the Bible’s conservative dating of the Children of Israel’s Exodus out of Egypt. In addition, it was only about a decade ago that what many believe to be a royal Egyptian mummy was returned to Egypt after spending almost a century and a half in a private Canadian museum. And whose mummy was it? Many now believe it to be the lost mummy from Ramses I’s empty sarcophagus which was discovered in the Valley of the Kings at Luxor. So in essence, the great Ramses I’s mummified body spent almost a century and a half in North America as a cheap tourist attraction! As the Book of Beginnings or Genesis ends, an old and dying Joseph makes the children of Israel promise to take his mummified body with them when they return, as God has promised, to the land of his ancestors, as well as his birth…the Promise Land. I believe Joseph has his body mummified for entirely different reasons than the pharaohs. Joseph’s mummified body will serve as a powerful symbol of Israel’s great destiny. It also serves as a bridge to perhaps our next great exploration, the second book of the Bible and the amazing story of the Children of Israel’s return to their Promise Land, beginning with their Exodus from Egypt. Can you figure out that purpose and how it might still relate to us today? The Bible’s very first word is the Hebrew word Bərēšīṯ, which means “in [the] beginning.” “Genesis” is actually the Greek word for “beginnings” or “origins,” and thus the origin for both the Latin and English transliteration: Genesis. So what’s our goal? Just to explore. Like an archaeologist exploring ancient ruins, we are going back to the Scripture’s beginnings to do a little Spiritual digging and poking around to see what was God doing before God’s Son was Spiritually conceived in his mother Mary’s womb? What were the world, people and life like from the very beginning? Well, 50 chapters later and exactly a year and a half later, we have reached the end of our first set of explorations into Scriptures’ ancient biblical ruins—the Book of Beginnings or Genesis. We have studied the lives of the Bible’s ancient patriarchs–how they came to know, be called upon and existed with God. They certainly were NOT perfect, and yet, God still used them; God was still glorified, despite their imperfection, as he is, despite ours, today. Despite mistakes, despite even death, God’s redemptive plan continued and still continues in and through us, his imperfect, faithful children. • The Creation: The Creator Creates His Creation and its Caretakers (Adam and Eve). Gen. 1-2. • The Fall: But a Crafty Adversary Emerges, Infecting the Creator’s Caretakers with a Virulent Strain of Deceptive Evil (non-beneficial actions). Gen. 3-4. • The Flood: The story of the righteous Servant and a devastating Flood. In order to Save his Creation from a self-destructive and merciless evil, the Creator Must radically purge or cleanse his Creation Gen. 5-7. • Creation’s New Beginning…Gen. 8-11. • Creation’s New Caretaker: The Creator Raises up, Chooses and Greatly Blesses a righteous and trusting Caretaker named Abraham. Gen. 12-25. • The Torch of the Creator’s Trusting Caretaking Now Passes to Succeeding Generations (Isaac, Jacob, Joseph…) Gen. 26ff. • Jacob’s older sons grow deeply resentful of their favored younger brother, Joseph. Gen. 37:1ff. • Joseph’s jealous older brothers cruelly sell their younger brother Joseph, against his will, into slavery, and then inform their grieving father, Jacob, that Joseph has been killed by wild animals. Gen. 37:12ff. • Despite being trafficked as a slave and falsely imprisoned, God’s favor mysteriously still accompanies Joseph. Gen. 39:1ff. • Despite correctly interpreting the baker and cupbearer’s dreams while in prison, Joseph’s good deeds, go momentarily unrewarded. Gen. 40:1ff. • Finally, when Pharaoh has two strange dreams that neither he, nor his priests, can’t interpret, the cupbearer remembers Joseph. Joseph is released from prison and is able to interpret Pharaoh’s dreams as seven years of plenty followed by seven years of severe famine. Gen. 41:1ff. • Pharaoh empowers Joseph to guide Egypt through these next fourteen years of plenty and famine. Gen. 41:38ff. • When Joseph’s brothers come to Egypt in search of grain, they have no idea that the Egyptian official that they are seeking to purchase the grain from is their brother Joseph. Then still portraying himself as an unknown Egyptian official, Joseph accuses his brothers of spying and forces them to leave their brother Simeon behind as surety that they will return with Joseph’s brother Benjamin. Gen. 42:1ff. • When Jacob’s sons tell him of the bargain that they were forced to accept for their grain, Jacob initially refuses to risk losing a third son. Gen. 42:19ff. • Finally, accompanied by Benjamin, Joseph’s brothers are able to persuade their father to allow them to return to Egypt where the Egyptian official hosts a great banquet in their honor. Gen. 43:1ff. • When a planted missing missing silver cup of the Egyptian official is found within Benjamin’s grain sack, Judah must now offer himself in place of his younger brother. Gen. 44:1ff. • Finally, no longer able to contain his emotions, Joseph finally reveals himself to his brothers and their need to return to Egypt with their father to survive the famine. Gen. 45:1ff. • Pharaoh, in gratitude for all that Joseph had done for both Egypt and his realm, offers Joseph’s family, the children of Israel, the best that Egypt has to offer. Gen. 45:16ff. • With God’s blessing Israel takes his entire family and flocks to Egypt where he is reunited with his son Joseph and settles in the land of Goshen. Gen. 46:1ff. • Israel, close to his death, makes Joseph swear that he will return his body to in the Promised Land to be buried. Gen. 47:1-12; 27-31. • During the famine, Joseph saves many lives from starvation, as well as, solidifying Pharaoh’s great wealth. Gen. 47:13-26. • Jacob, shortly before his death, doubles Joseph’s inheritance by adopting Joseph’s two oldest sons. Gen. 48:1ff. • Jacob (Israel) prepares to die and prophetically blesses his 12 sons. Gen. 49:1ff. • After blessing his sons, Jacob dies, and his sons fulfill his wish to take his body back to Canaan to be laid along side the bodies of his fathers. Gen, 49:28ff. • Joseph kindly exhorts his brothers not to fear that he will take retribution against them for the wrongs he suffered at their hands—what you meant for evil, God meant for good. Gen. 50:15ff. 22 Now Joseph stayed in Egypt, he and his father’s household, and Joseph lived one hundred and ten years. So if Joseph came to Egypt when he was 17, Joseph lives in Egypt for almost a hundred years. Amazing. 23 Joseph saw the third generation of Ephraim’s sons; also the sons of Machir, the son of Manasseh, were born on Joseph’s knees. So despite the hardships and loss of not being with his family for all those years, Joseph is now greatly rewarded, not only with being reunited with his family and delivering them through the harshest of seasons, but he experiences the births of his great great grandsons. Joseph has been greatly rewarded. It does make one wonder, did he maintain his position within Egypt throughout his entire life time? Or did it gradually diminish? What about his children and children’s children? The Promise remains, and just as his father, Jacob, was keenly aware of it as he was about to die, so is Joseph. I may have made Egypt great, but my destiny is still tied to the Land. 26 So Joseph died at the age of one hundred and ten years; and he was embalmed and placed in a coffin in Egypt. 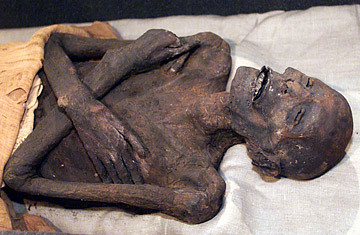 Joseph is embalmed as the Pharaohs were. Makes one wonder? Has Joseph’s body survived, and might it be found even today or someday in the future? • Joseph lives in Egypt for almost a century and is able to see his great great grand children. • As Joseph is about to die, much as his father before him, he makes the sons of Israel swear to carry his body or bones back to the Promise Land when indeed God fulfills his promises to their fathers to bring the children of Israel back to their forefathers’ Promised Land. Summary: Then many years later, as Joseph dies, he makes Israel’s descendants promise to carry his bones back to the Promise Land. • Still after living in Egypt with all its wealth and splendor, and despite being one of its most influential, salvific figures, there is no doubt where Joseph’s heart and faith lies. His embalmed body, embalmed as Egypt’s pharaoh-gods, represents God’s presence, providence and promise in the lives of Israel’s children. The plan is always to go back to the Promised Land. It was never, in the long run, about Egypt. Egypt was a temporary home…a temporary resting place…a transitional place…in order for God to build up a nation of 600,000+ men over the next four centuries, as well as, give the wicked Amorites who dwelt in what was Israel’s Promised Land, grace, or at least no excuse when it came to their pagan fertility worship. Traditionally, they not only failed to recognize God as Creator and Lord, but they engaged in every kind of sexually, immoral vice, as well as, the sacrificing their own children in order to please their various fertility gods. It would take roughly 700 years (300 years from the time of God’s promises a land, people and blessing to Abraham [2100 BC] until Joseph dies [1800 BC], plus another 400 more years before the Children of Israel under Joshua’s leadership reclaim her Promised Land…1400 BC) or seven centuries for those sins to reach their full measure or completion. It is difficult for me to even fathom seven centuries, or at least a promise being made that takes seven centuries to complete. But, because there in essence is no time to God, or as the psalmist describes and Peter reiterates, a thousand years is like a day to God (Ps. 90:4; 2 Peter 3:8), seven hundred years is like a partial day or a few hours to God. To us humans, it is huge; to God, a blink of an eye. So what keeps us going in the mean time, if we can’t see or will not see the fulfillment of God’s promises in our lifetime? Faith (according to Hebrews 11). Trust, and thus the biblical patriarch’s legacy. Paul, writing to the Roman Christians, references Gen. 15:6 when he writes, “Abraham believed (or trusted God…at his word…his promise), and it was accounted to him as righteousness.” (Romans 4:3). Faith in God, hope in God, trust…a trust that leads to a continually maturing obedience to God…sustains us during an entire lifetime when we may not see the fulfillment of God’s promises or deliverance. No doubt faith sustained Russian Christians during seventy years of Communistic atheism. Faith has sustained Chinese Christians for about the same length of time. Faith sustained the early church for almost three hundred years until under Emperor Constantine, state restrictions and persecution of Christians ceased. And faith is what sustained Joseph during his difficult days until he was reunited with his family, and no doubt faith will sustain the children of Israel until they return to their Promised Land with the bones of their patriarch Joseph. Joseph was clearly sending a message. My home is NOT Egypt. My home is the Promise Land. By the same token, by faith, our home, the Christian’s home, is not this earth… not now, not here. We are renters, tenants, shepherds. But we long to be reunited with our Lord in his heavenly paradise. By faith we momentarily live in Egypt, but we live to go home, just like those whose feet had never touched Canaan’s soil, somehow, someway, looked forward to the day that they would walk on Canaan’s fertile soil or their children or their children’s children would. In the mean time, they lived by faith that it would take place some day. The same is true with us. Though we have not seen heaven literally, oh…perhaps only briefly, in moments or worship when it seems that heaven bends down and kisses earth…we have that promise of eternal life, or life with God in heaven forever…and whatever that means. We hold that hope. And someday we will. • In the meantime, we hope to see our great great grandchildren as Joseph did. Egypt ain’t bad. At least at first it wasn’t. It was very good. Very good. But this earth is evil and evil is enslaving, and just like the children of Israel are about to become slaves, so it is true of us. This life, this earth can be very mixed, up and down, good and bad. We thank God for his blessings, that he will see us through the difficult times, and that a few of us will live to make a significant contribution on this planet—hopefully, the deliverance of many from sin’s destruction—as well as to see our great great grandchildren, but we also understand, as was with the case of Jacob and Joseph, most all of us will experience our difficult seasons. And yet, as God is with us in the midst of the trials, we know that a much greater deliverance awaits all of us. • Thus the story of Genesis…or beginnings, is our story…the Christian’s story. Genesis lays the foundation for so many stories to come. We see it all, Creation, naivete, deceit, sin, consequences, grace, jealousy, murder, sin’s contagion, God’s judgment, more mercy, the rebuilding of earth, man’s genius to build, the struggle to communicate with another, tribal rivalries and conflicts, immaturity, more deceit, God’s control and knowledge of the future, man’s impetuousness, man’s lack of trust in God, man’s great trust in God, man’s patience for God’s promises to be fulfilled and countless other truths and lessons. It’s all there. All. And by studying the lives, lessons, obedience and mistakes of our Spiritual forefathers, we can not only learn about our own human natures, but how our only real deliverance lies in a simple child-like faith or trust in God. Faith saves. Amazing. Thanks… Thank you for your many graces this past week, Lord. What you shared through me this past Sunday was amazing. I mean I knew what I wanted to communicate, but even at the last minute, I was making changes and adjustments, adding a video, a Keynote, illustrations, tweaking the order…but somehow it came out almost exactly as I had hoped—that through a conversation with my aunt I realized how we can build walls of self-deception and denial and in the process make things, such as family, greater even than the truth or you, God, and thus, in essence, turn what was a gift or stewardship into an idol, and in doing so, NOT seek your kingdom or righteousness or your Son and Spirit’s salvation or deliverance from sin or our imperfection, and therefore, skewing our decisions in such a way as to self-sabotage your goal or desire, through our righteous, truth-based choices to provide us with a divinely filtered version of our wants…and thus our true needs (Matt. 6:33). I get it, Lord, seeking your truthful deliverance from our own self-wickedness and denial is like trying to make 2 + 3 = 4. It just doesn’t work, and we don’t get our real needs met. Instead, we get a skewed version of our poorly-filtered wants being partially met. Since Creation though and since you’re a merciful God of deliverance from our sin, it was always 2 + 2 = 4. Your design for Creation has always been for your desperate creatures to seek your deliverance, and when they do, your Spirit has promised to light a path in the midst of the darkness so that we can see the food, drink and clothes or basic needs that your have provided for us, just as you have provided for the rest of Creation, including the sparrows and lilies. 2 + 2 = 4. Thank you. Thank you. Thank you. Thanks also for some incredible ministry moments this week, two in particular. Two, maybe three, very real, powerful…and one perhaps, off the chart…a breath of heaven. Struggle(s)… Father, how does one taste heaven and then return or live on earth? How does one experience the divine and not crash back to earth? I don’t suppose it is possible to sustain heaven’s presence 24-7, or at least I haven’t been able to do. I probably shouldn’t complain, but I feel so much like a child when I do experience your grace, your joy, your presence, your power, that afterwards, I am absolutely lost. Sometimes I need to rest afterwards, but then it seems so hard to return to the mundane, the more common tasks that need to be done, and my spirit so so rebels. Thanks for heaven, but I suppose I really need to know how to transition back to earth. Perhaps softer landings, God. Truth(s)… Joseph enjoys this life’s blessings, after paying such a difficult early price. But despite both the blessings and sufferings of this world, his hope lay squarely upon something for his children in the future. It wasn’t about building a great monument to himself in order to attain a better place in the afterlife, much like the pharaohs had done, rather, it was about using his body to send a message. When the children of Israel reached the Promised Land four hundred years in the future, they would know that God was faithful to his promises. That Egypt was not their permanent home; they were not slaves; they were God’s covenant children…the children of promise. And just as God had brought Joseph through his harsh unjust treatment at the hands of others to his place of deliverance and salvation, God would do the same for the sons and daughters of Israel. Joseph’s embalmed body was that symbol or token of salvation past and salvation future. Remember to have fun, sense the Spirit’s leading and develop a love for these kids. This entry was posted in Learning Center Lessons and tagged Children of Israel, Genesis, Promise on July 25, 2014 by admin. Today I was thinking about all the dycnfustional people in the bible…broken families, burdened with sin and stupid choices. God is faithful and I am thankful to count you as my friend. Good post.